Bring a large pan of water to the boil, add the spinach and blanch for 1 minute, drain, refresh under cold water then squeeze out as much water as possible. Roughly chop and set aside. Heat the butter and oil in a large pan and gently cook the leeks for 5 minutes until softened and caramelised. Add the thyme and garlic, fry for a further minute then add the mushrooms and fry for an additional 5 minutes until softened. Remove from the heat, stir in the chestnuts and leave to cool. Tip the cooled mixture into a large bowl and stir through the cheese and spinach. Lay a large sheet of cling film on the work surface and tip the mixture into the middle. Mould into a rough log shape then roll up tightly in the cling film to make a 26cm-long cylinder. Chill for 1 hour until firm. Preheat the oven to 200°C, gas mark 6. Dust the surface with flour and roll the pastry into a 34x28cm rectangle. Lay the cylinder of filling on top and unwrap. Whisk together the egg yolk & milk and brush along the edges of the pastry. Carefully roll the filling in the pastry finishing with the join on the underside. Press the ends together to seal and crimp with a fork. 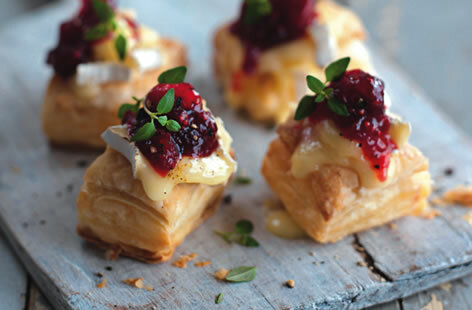 Cut any pastry trimmings into festive leaves and use to decorate the Wellington. Place on a baking sheet lined with baking parchment and brush with the remaining egg. Bake for 30 minutes until the pastry is golden brown and crisp. Leave to stand for 5 minutes before slicing. Preheat oven to 200°C, gas mark 6, and line a baking tray with non-stick baking paper. Heat the olive oil and gently cook the red onion until softened. Add the balsamic vinegar, red wine, sugar, cranberries and cook until it resembles a jam-like consistency (approx. 10 minutes). Set aside. Roll out the puff pastry on a lightly floured surface, cut into 2.5cm squares. Bake for 10 minutes until golden and risen. Top each square with a small slice of Camembert and a spoonful of sauce. Place back into the oven for a couple of minutes to melt the cheese. Remove from the oven, add soft thyme leaves to garnish and serve. mark 4 or fan 160°C. Spread the cashews on a baking tray and toast for 8-10 minutes, until golden. Cool, then chop roughly and set aside. Meanwhile, melt 40g of the butter in a large frying pan, add the parsnips and some seasoning and fry over a high heat, stirring occasionally, for 3-4 minutes. Until starting to brown. Reduce the heat and add the spices. Cook for 1 minute, stirring, then mix in the leeks. Pour over 150ml water, cover the pan and cook gently until the parsnips are soft when pierced, and the liquid has evaporated. Spread out on a large plate and leave to cool, then mix in the cashews. To assemble the strudels, melt the rest of the butter and brush some onto a baking tray. Layer up 2 sheets of filo at a time, brushing each one generously with melted butter. Spoon one sixth of the filling alone one of the shorter sides, making sure to leave a 5cm border at either side of the filling. Fold in the side, then roll up the filo in a log shape to enclose the parsnip and leek mixture. Place on the tray and brush with more of the melted butter. Make light cuts in the pastry alone the top. Repeat to make 6 strudels. Mix the sesame seeds together and scatter on top. When ready to cook, preheat the oven to 200°C, gas mark 6 or fan 180°C. Bake the strudels for 30-35 minutes until crisp and golden brown. To prepare in advance, assemble to the end of step 3. Chill for up to 48 hours or freeze for up to 1 month. Cook from frozen for 55 minutes, or add an extra 10 minutes cooking time if cooking from chilled. yeast into a mixing bowl. Make a well in the centre and add the 350ml lukewarm water. Gradually mix together to form a slightly sticky dough, then turn out onto a lightly dusted work surface and knead for 10 minutes or until smooth and elastic. Cover the bowl with a cloth and leave in a warm place for 1 hour or until doubled in size. Cut, the cheddar, gruyere or mozzarella into 1.5cm cubes. Mix the parmesan with the Italian seasoning and chopped rosemary in a shallow dish. Pour the melted butter into another shallow dish. Grease a large baking sheet with a little butter and sprinkle with the polenta. Knock back the dough and knead once more until smooth and elastic, then divide into 25 even-sized pieces. Working with one piece of dough at a time, knead it a little, then press a piece of cheese into the centre and seal the opening by pinching the dough together with your fingers. Roll into a ball using your cupped hand and the work surface. Put an upturned 10cm rounded heatproof dish or ramekin into the centre of the baking sheet. Roll the dough balls briefly in the melted butter, then the parmesan cheese mixture. Place the balls around the dish, leaving a 5-6mm gap between each ball and also the edge of the dish. Make a second ring around the outside of the first, again leaving a little space around each one to allow them to rise. Cover loosely with a sheet of lightly oiled cling film and leave to rise somewhere warm for 40-60 minutes until doubled in size. Just before baking, heat the oven to 190°C, gas mark 5 or fan 170°C. Bake the wreath for 40-50 minutes until lightly golden brown, covering it loosely with foil if the cheese on the outside starts to go too brown. Remove the wreath from the oven and leave to cool slightly for a few minutes. Decorate with fresh rosemary sprigs, some sea salt and the peppadew peppers. mark 4, and line a baking tray with non-stick baking parchment. Place the spinach in a large saucepan, cover and cook until just wilted. Drain in a colander, allow to cool then squeeze out all the excess water. Chop the spinach very finely then mix with the crumbled feta and oregano. Season with plenty of ground black pepper. Lay the sheets of filo on a large board and cut in half lengthways to give sheets approximately 20x30cm. Cut these into 4 rectangles, each about 10x15cm. Brush a rectangle with melted butter and place a tsp of the spinach mixture at the end nearest to you, spreading it along with width of the pastry. Toll it up quite tightly to give a neat parcel. Place on the lined baking tray and repeat with the remaining pastry and filling until you have used it all up. Brush the tops of the filo fingers with a little melted butter and sprinkle the sesame seeds over. Bake on the middle shelf of the oven for 15 minutes, until golden and crisp.